B. TYPES OF TRAINING EXERCISES. D. VARIATIONS OF THE GROUP ATTACK. F. COUNTERMEASURES AND DECEPTION EXERCISES. The control of aircraft in training exercises is an important function of CIC. Nothing can better prepare a ship's CIC for battle than conscientious drills before action begins. 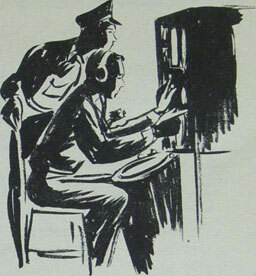 Radar and radio equipment must be checked and pilots and CIC must drill together to become a smooth-running team. 1. Air group attacks: detection and interception. 3. Countermeasures and deception exercises. 4. Gunnery, torpedo, and bombing runs. Some of these exercises involve the use of CIC communications facilities only. Gunnery runs, for example, in which a sleeve is towed as a short range AA target, are conducted too close to the ship to permit good radar detection and plotting. The simulated attack in which a large proportion of the air group launches an air attack on the ship or task group involves all the elements of aircraft control, detection, tracking, communications, and actual interceptions. It provides the only chance to practice air control against sizeable raids at sea. To give the fullest training to the air group and CIC, the attack is treated as an actual raid. Within CIC reports are passed to bridge, flag, gunnery, and air plot on the progress of the attack. If the ship is operating in a group, a report is also made to the group CIC officer who directs interceptions, deploys the CAP and broadcasts warnings to the other ships in the group. When the attacking group comes within range, the group gunnery coordinator and CIC liaison officers take over and begin feeding plots, courses, and speeds to battery plot and the ship CIC officers report "tally-hos" and splashes as they come in from the CAP. To give the fullest practice to the air group as well as CIC, the attacks should vary from torpedo to glide or dive bombing attacks. For example, an exercise called "Moosetrap" has been developed which closely simulates the tactics used by Japanese suicide bombers. It has taught both pilots and CIC officers invaluable lessons and helped plug several holes in our general scheme of defense. exercise is used for the whole force en route to or from an operating area. Because the practice here involves the closest approach to reality that can be achieved, it is by far the most useful type of training exercise yet divised. Calibration runs, the second general type of exercise, are an essential to CIC operations. They entail the control of aircraft in flights designed to calibrate search and fire control radars and the ship's range finders. Since these runs require flights of predetermined patterns it is normally necessary to brief the pilots before take-off. Because of the fact that many of these runs (fall for long flights which may extend beyond VHF/UHF range, it is essential to define safety procedures in advance. Countermeasures and deception exercises are relatively new to the fleet. With the development of enemy radar and fuller use of jamming, "Window," "balloons," and other types of deception, training exercises of this sort have assumed increasing importance. For CIC personnel, these exercises provide an opportunity to practice scope reading through jamming and "Window." It is usually true that, once observed and identified, "Window" presents a relatively minor problem to our air search gear. The same cannot be said for some fire-control radar unfortunately. However, an operator experienced in detecting "Window" can immediately begin to take corrective steps. For pilots, coutermeasures exercises are also useful in teaching them the best methods of using "Window" and "balloons." Night fighter pilots, whose scopes have sometimes been jammed successfully by the enemy pilot under pursuit, also gain experience in combatting this type of evasive tactics.